Since the 1970s, the Lower Big Blue NRD has been involved with the construction of several large dam and reservoir projects. These projects were designed as part of the NRD’s effort to preserve and protect the natural resources. These dams and reservoirs aid in the prevention of floods and soil erosion, facilitate groundwater recharge, and provide opportunities for groundwater research. As these dams and reservoirs were originally built to protect our natural resources, they have come to serve so many other purposes. These purposes include a natural habitat for fish and wildlife, and an abundance of recreational activities that can be utilized by the public year-round. 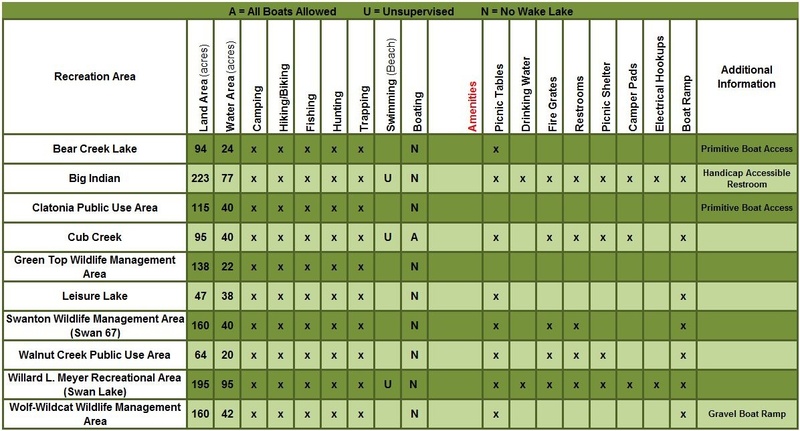 The Lower Big Blue NRD manages nine of these recreation areas. These areas are: Bear Lake Wildlife Management Area, Big Indian Recreation Area, Clatonia Public Use Area, Cub Creek Recreation Area, Leisure Lake Wildlife Management Area, Swanton Wildlife Management Area (Swan 67), Walnut Creek Public Use Area, Willard L. Meyer Recreation Area (Swan Lake), and Wolf Wildcat Wildlife Management Area. These areas provide the public with opportunities for hunting, fishing, camping, hiking, and many other outdoor activities. - Camping is first come, first served. No reservations. Use the interactive map below to view the Lower Big Blue NRD Recreation and Wildlife Management Areas. Clicking on the area will show the list of amenities. For more information, click on each area's page from the drop-down menu above.